This article is a cross-post from Murphy Research: http://www.murphyresearch.com/index.php/blog/read/supercharging-your-business-with-choice-modeling. 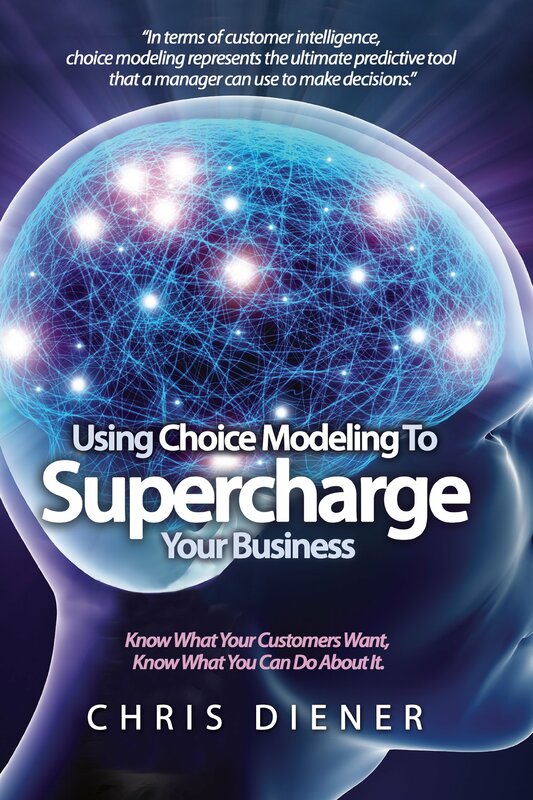 It has been a few years in the making, but I finally updated my book, Using Choice Modeling to Supercharge Your Business. While the fundamentals of the book remain unchanged, the increased prevalence and continued evolution of choice modeling necessitated a few tweaks to ensure continued relevance for market research professionals. Choice modeling is the most advanced and powerful predictive modeling approach to critical issues in market research insights. Because of this, the method is still surging in its use and breadth of application areas. New people are learning about it every day and are being exposed to it in various capacities at large volumes. From communications to product development and brand strategy, it is the premier approach to knowing what your consumers want and the best way of giving it to them. The ways in which choice modeling differs from and is better than other approaches remains the same. In a choice model, preferences for product attributes, rather than abstract concepts, are researched to model the decision making process of an individual or segment. It is not a panacea, but it does have specific areas of application that are most beneficial, and in these areas, it functions second to none. Need to know how to best price your product or service? Or how to best configure, update or change an existing product or service? Need to know how to manage your product line to minimize cannibalization and maximize revenue and profits? Or how to best position your products and among which consumers? These are all virtually timeless questions that choice modeling effectively answers. The challenge is that it really is a complex and advanced approach. For those who are not experts in it or do not deal with it very often, it may not be intuitive and there are dangers when choice modeling is not used to its best value. It can also be hard to communicate with others about the technique and outcomes. That’s where this book comes in. Using Choice Modeling to Supercharge Your Business is a unique resource to the market research industry. It fits the needs of non-technical professionals who are seeking to drive the creation of value from the application of choice modeling. To celebrate the new edition and printing and to introduce more people to this fascinating and incredibly useful methodology, MURPHY RESEARCH IS OFFERING A FREE CRITICAL CHAPTER FOR IMMEDIATE DOWNLOAD AS WELL AS A SIGNIFICANT DISCOUNT ON THE ENTIRE BOOK. JUST CLICK HERE TO START SUPERCHARGING YOUR BUSINESS. This entry was posted on June 17, 2014, 4:18 pm and is filed under Intelligent Analytics Leadership, Market Research Leadership. You can follow any responses to this entry through RSS 2.0. You can leave a response, or trackback from your own site.